MEHF is partway between an IDE and a REPL. (The name "MEHF" is partway between "IDE " and "REPL.") It's designed to offer quick testing of code fragments for which an IDE would be overkill and for which a REPL is either unavailable or too limited. 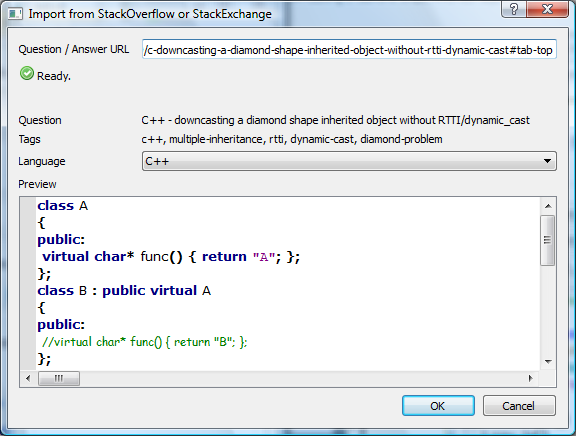 Because MEHF is (intended to be) ideal for use with the kinds of code fragments that show up on Stack Overflow, it integrates with Stack Overflow. You can test a code example in MEHF then copy it to the clipboard as Markdown for posting to Stack Overflow, or you can import someone else's code from Stack Overflow into MEHF, run it, fix it up, then copy it to the clipboard for posting back as an edit or as an answer. I tend to have a collection of sample scripts, scratch projects, and test files that I use to test out code snippets for a blog post, StackOverflow question, or incorporation into a larger program. MEHF is designed to make this kind of experimentation a lot more streamlined. For StackOverflow in particular, MEHF should reduce the temptation to post untested code (which I've seen happen on multiple occasions, resulting in incorrect code that delays getting a good answer) and should reduce the tediousness of firing up an IDE or text editor + command line just to test an answer to someone's question. MIT. MEHF also depends on PyQt4 and QScintilla2, which are available under the GPL. You can download MEHF from http://code.google.com/p/mehf/. A source distribution and a Windows executable are currently available. Instructions are available at http://code.google.com/p/mehf/wiki/GettingStarted. Windows and Linux. Mac OS X support is planned, once I fix my MacBook Pro. By Josh Kelley. You can contact me at joshkel at gmail dot com, or submit an issue at MEHF's Google Code page. MEHF is written in Python. 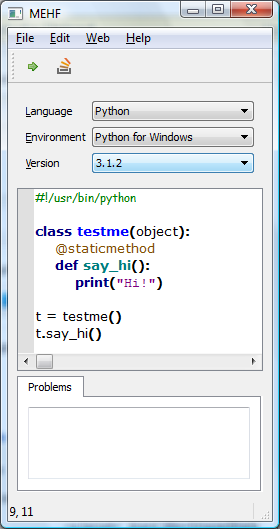 It uses PyQt4, QScintilla2, and Lucas Jones' Py-StackExchange. Browse other questions tagged app editing dev-tool .